Parishioners in some Queens churches are going to notice some changes Sunday. The Diocese of Brooklyn and Queens has merged six churches into three parishes around the borough to save resources and money. Two Brooklyn churches have also been combined. The mergers, which took effect Sept. 1, are the fourth wave of reconfigurations by Bishop Nicholas DiMarzio since early last year. Individual churches will remain open, but the number of Masses is likely to be cut. "We really connected with the folks in each of the parishes and explained the reason why the mergers are necessary," said the Rev. Kieran Harrington, vicar of communications for the diocese. "People's lives won't be disrupted because the houses of worship are still open." Religious education and senior programs will be mostly unchanged, but officials will combine church bulletins and cut office expenses. Running an urban diocese, with many working-class and new immigrant families, is a challenge, Harrington said. He also stressed the mergers were needed because of a declining number of priests. "People understand the reality because of the shortage of vocations," said the Rev. Jim Cunningham, who now leads the St. Mary Star of the Sea/St. Gertrude parish in Far Rockaway. 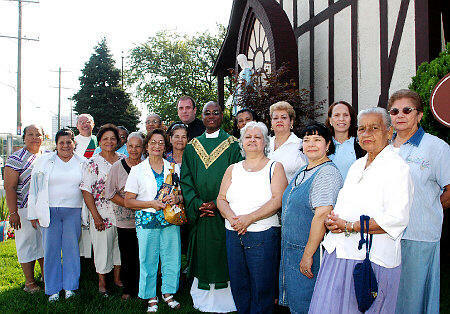 St. Gertrude lost its full-time pastor in July 2007, when the popular Rev. Brendan Downing died of cancer. Cunningham has led both churches since then.